The allnite Brute is our entry level into the allnite Brand of mattresses, and even with its low price point it features a quilted covered product, the allnite Brute has been one of Lensyl’s best selling products for many years in the trade and at Lensyl’s retail outlets. Clearly both consumers and our dealers have demonstrated that this mattress provides unmatched value. It is an eight inch thick mattress of 1.2 lbs density polyurethane foam covered in dust mite hypo allergic damask ticking. The allnite Brute provides good back support for a lighter weight adult, a teenager or child. 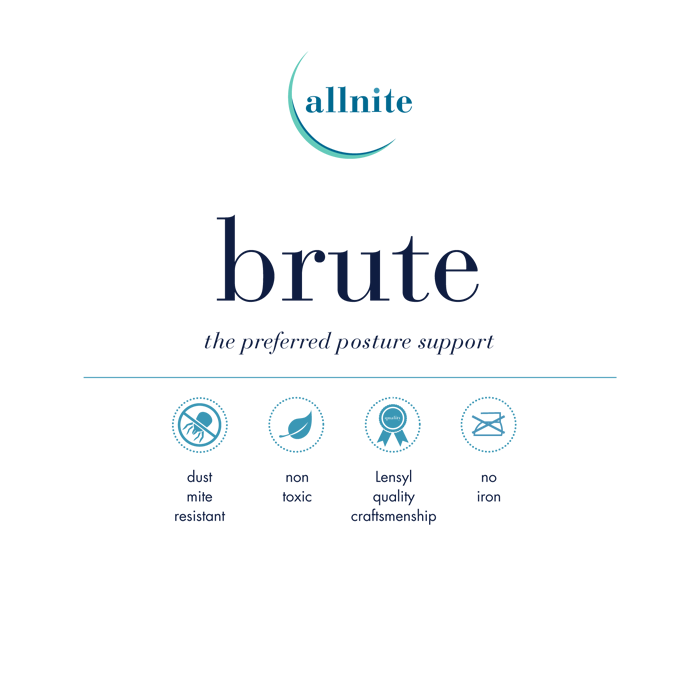 Due to its low price, The allnite Brute is the perfect choice for the budget conscious consumer that wants to avoid an inferior quality foam mattress that will inevitably flatten in no time. The allnite Brute features our high standard Durafoam as its core and therefore is a mattress of good quality, but due to its very low price point we do not provide a warranty with the purchase of this product.